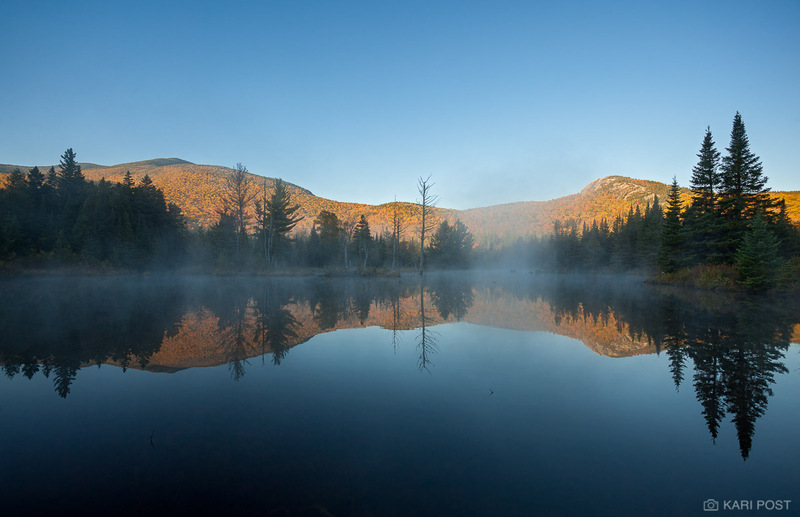 In October 2014, I partnered with the Appalachian Mountain Club to offer an autumn photography workshop for photographers at their White Mountains Highland Center in Crawford Notch. Most of these photos were snapped in the days prior to the workshop, when I was scouting locations on my own. Because the foliage varies every year, it was important for me to visit some of the locations I had in mind prior to bringing students to them, to make sure the timing of the leaves changing color matched with the dates our group would out in the field. I also tend not to take many of my own photos when leading workshops so that I can focus more on the needs of my clients, so taking time to check out some locations ahead of time was a great opportunity for me to get some snaps in. We ended up having a fantastic group of photographers, beautiful fall foliage, and many opportunities to learn and practice skills, despite one not-so-great weather day in the middle of our weekend. The feedback I got from my students was extremely positive, and I hope to be able to partner with the AMC for more workshops in the future. Posted in Trip Reports and tagged Appalachian Mountain Club, AMC, autumn, fall, foliage, White Mountains, New Hampshire, NH.